Mark Alan Stamaty’s Village Voice comic MacDoodle St. is unlike anything else in print. Each installment of the weekly strip, which ran from 1978 to 1979, is packed with sight gags and digressions, the panels near to bursting with recurring characters and critters...The final strip shows Malcolm and friends sailing out of the city on MacDoodle Airlines, promising to “be back after a while.” However, the strip never returned. This week, New York Review Comics has reissued the complete MacDoodle St. in book form. A new addendum, written forty years after the strip’s finale, reveals why Stamaty said goodbye to MacDoodle St. and how, in the process, he rediscovered the joy of being an artist. including about half of the new Mark Alan Stamaty illustrated introduction. Every day our house gets three national papers, two regional papers and four local dailies. 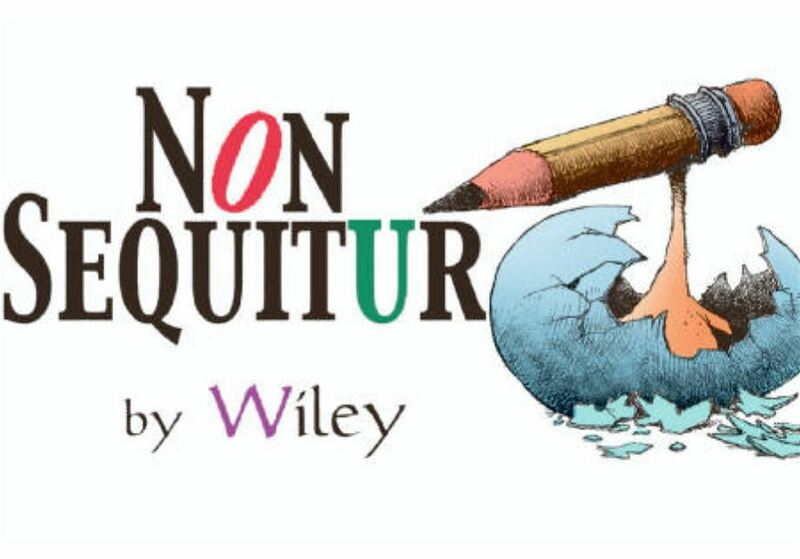 When a paper dropped Non Sequitur, journalism professor Bill Knight dropped the paper. Mallard is a strip I read daily. In 2015, I indicated I was canceling my 30-year subscription until Mallard was reinstated — and when it was, I resubscribed. Again, I will cancel my subscription until Mallard is reinstated on the comic strip page. Terry Ebaugh has dropped the paper before over Mallard Fillmore, and he’s willing to do it again. A parody of the (in? )famous Chick Tracts is appearing across the nation. 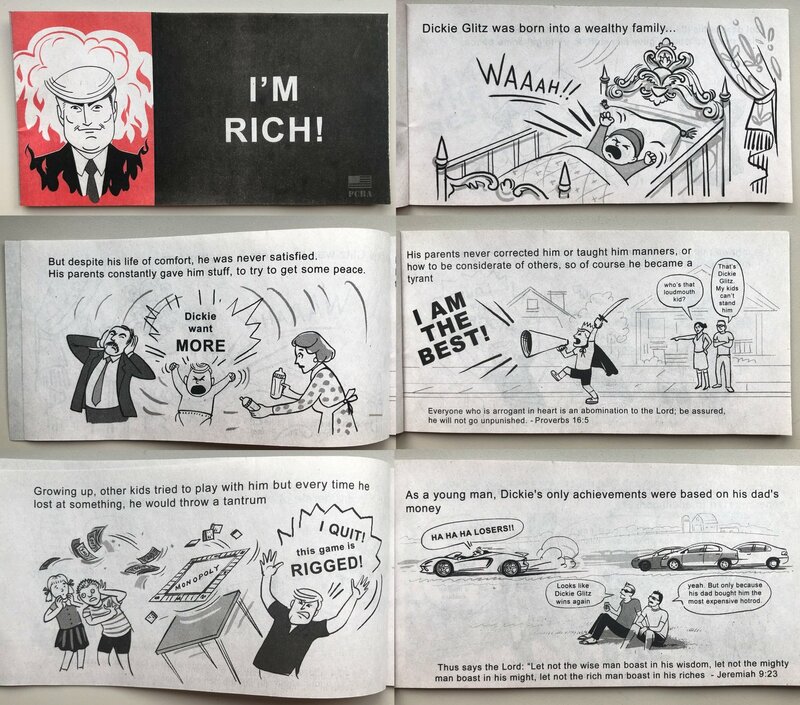 In the final image of “I’m Rich!,” Dickie Glitz stands on the White House roof, waving a bullwhip, yelling: “Mine! ALL MINE! Ha ha! I AM THE BEST!” while the Putin-ish devil grins in a corner. It was the waning days of 2017, and Andrews McMeel was looking to make a change. The venerable comic “Nancy” had been around for eight decades, and the syndicate was seeking to give the once-highly popular strip a creative transfusion with some new blood. “When we were thinking about people to approach — as well as reviewing pitches from other very talented cartoonists — we weren’t only looking at people who had a track record in syndication,” says Andrews McMeel editor Shena Wolf. 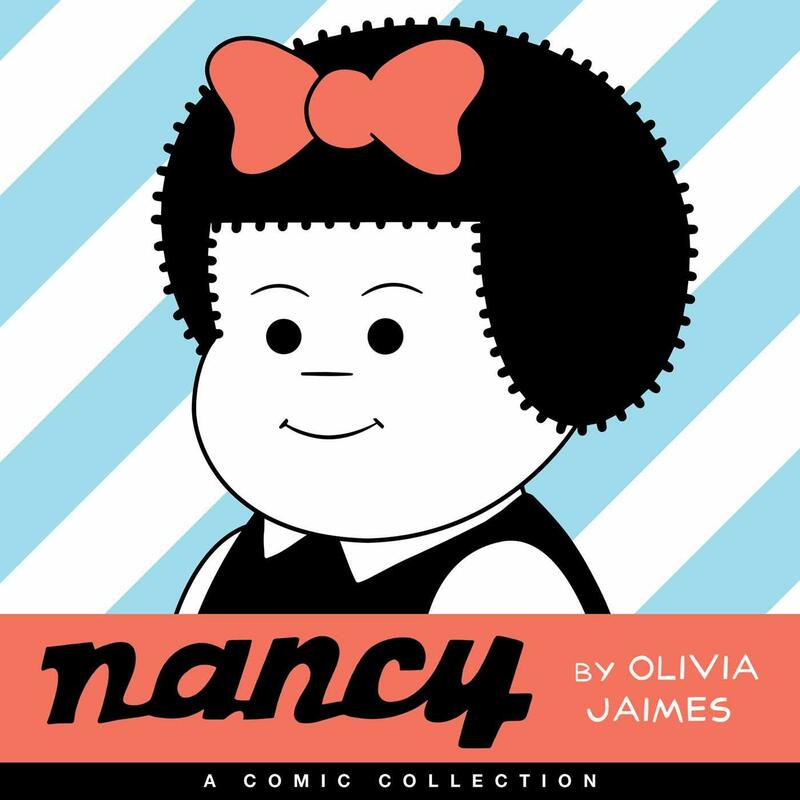 The artist Olivia Jaimes made her debut as “Nancy’s” cartoonist one year ago Tuesday — the first woman to shepherd the strip, as well as the first of its eight notable creators who didn’t take a traditional path to newspaper print syndication. on the 1st anniversary of the revitalized 80-year-old character. Well, that makes a world of sense. I guess he figures it’ll trigger more snowflakes in one place than in the other. Maybe he can make them so mad they’ll write in and threaten to cancel their subscriptions! Though it’s not as entertaining as the other quotes and citations, the last page should also contain “John 11:35”. 28 queries in 0.157 seconds.